Northrop Grumman Corporation celebrated Tuesday the 20th anniversary of the first flight of its autonomous Global Hawk high altitude long endurance aircraft. 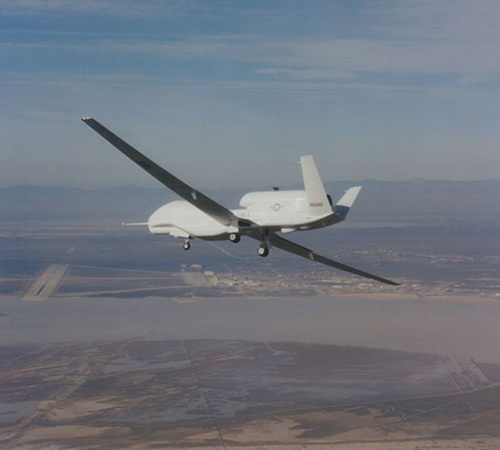 The Global Hawk System remains on duty around the world and is one of the premier providers of persistent intelligence, surveillance and reconnaissance information supporting the United States and its allies. The first Global Hawk aircraft, named Air Vehicle 1, or AV-1, was built by Teledyne Ryan Aeronautical at the Ryan factory near San Diego’s Lindbergh Field. Northrop Grumman would acquire Teledyne Ryan in 1999. On a clear and calm morning, February 28, 1998, AV-1 taxied itself to its take-off position at Edwards Air Force Base in California (photo). The aircraft was all white, except for its U.S. Air Force markings and sported a unicorn-like mast out of the front of its nose. Ryan pilot Mike Munski, in the ground control station nearby, clicked the take-off button on his control console and AV-1 took off into the desert sky. After a 56 minute flight, the first Global Hawk landed safely and stopped itself on the runway, just six inches off the painted centerline. The first Global Hawk aircraft were in the Advanced Concept Technology Demonstration program, sponsored by the Defense Advanced Research Projects Agency (DARPA). DARPA is responsible for the development of emerging technologies for use by the military. “Those of us in the Global Hawk program today owe a great deal of gratitude to those who developed the first Global Hawk and helped create this weapons system that is so vital to serving our nation and its allies,” said Lauren Stevens, Vice President and Program Manager, Global Hawk program, Northrop Grumman. “AV-1 and the Global Hawk Program have shaped aviation history and some of those Ryan employees who worked on AV-1 are still on the program today working to increase the system’s capabilities and continue to defy expectations,” he added. Able to fly at high altitudes for greater than 30 hours, Global Hawk is designed to gather near-real-time, high-resolution imagery of large areas of land in all types of weather - day or night.